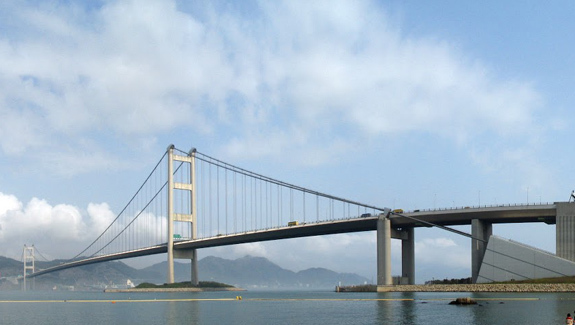 Renowned for being the world’s ninth longest suspension bridge, this bridge spans between the two islands, Tsing Yi and Ma Wan, where its name originated from. It has two decks and carries both road and rail traffic, which also makes it the largest suspension bridge of this type. The span is the largest of all bridges in the world carrying rail traffic. The bridge was designed by Mott MacDonald, and was built in 1997. By now the Tsing Ma Bridge is a major tourist attraction and also a favourite scenic spot for locals. To keep it looking clean and prevent ingress of water and avoid salt corrosion within the reinforced concrete, Tech-Dry Solid Silane was applied to the concrete pylons and decks. Tech-Dry Solid Silane is a water repellent treatment to the bridge’s concrete structure, both above and below. This treatment protects the concrete and steel reinforcement against corrosion caused by moisture and chloride ion penetration. This unique product, formulated as a topical silicone cream, can be applied to horizontal, vertical and overhead surfaces without run-off and subsequent contamination to surrounding marine areas. The long surface contact ensures deep penetration into the concrete substrate guaranteeing long term protection.